Spot the blue, pink and black then as shown, line up tens reds in a diagonal across the top of the table. 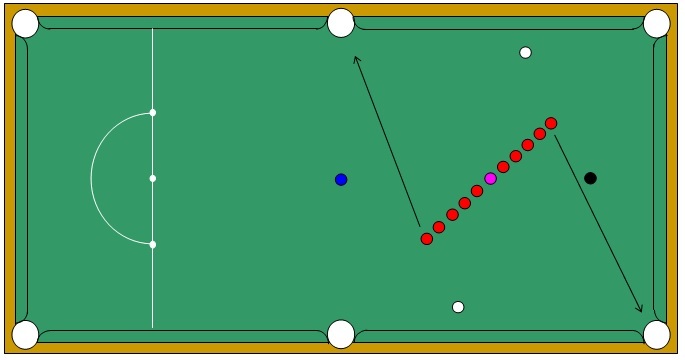 With the cue ball played within two balls width of the side cushion each time, straight pot the five reds below the pink into the corner pocket and the five reds above into the middle pocket. Repeat, this time playing the cue-ball from tight under the cushion each time. Award a point for each red potted and record score achieved. Position fifteen reds across the middle of the table with the middle red on the blue spot. 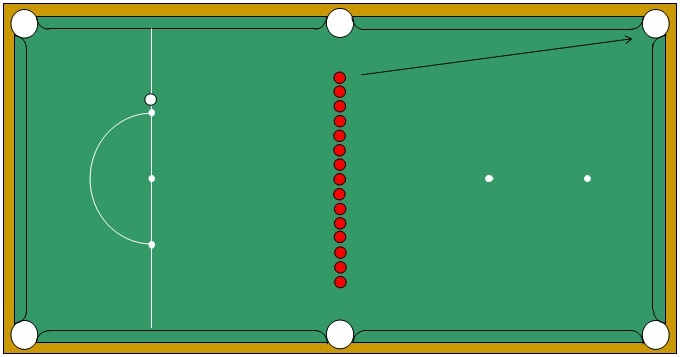 With the cue ball placed on the baulk line each time, straight pot each red into the nearest top corner pocket. As shown, evenly line up five reds each side of the pink spot. 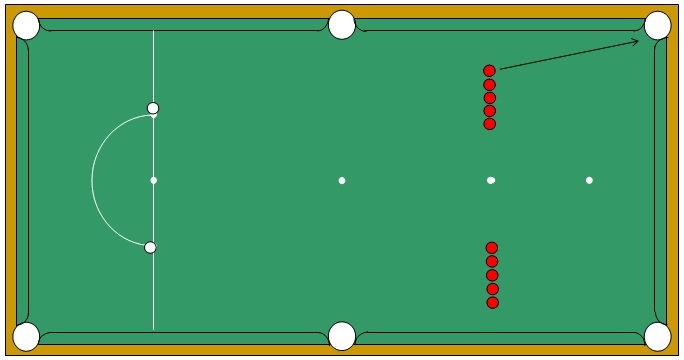 With the cue ball placed on the baulk line each time to form a straight pot into the nearest top pocket, try to pot each red. 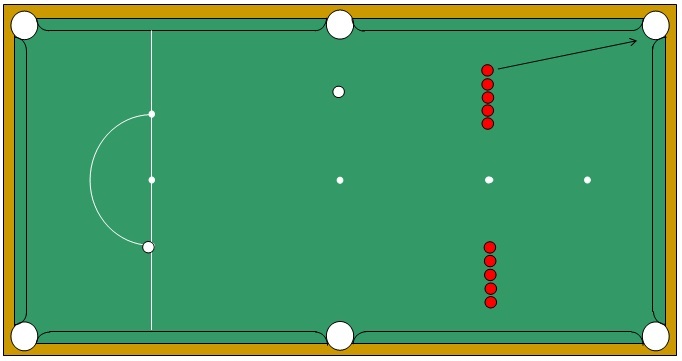 With the cue ball placed between the middle pocket each, try to straight pot each red into it’s nearest top corner pocket using the Rest. As shown, evenly position five reds so they are lined up with the black and the top pocket. 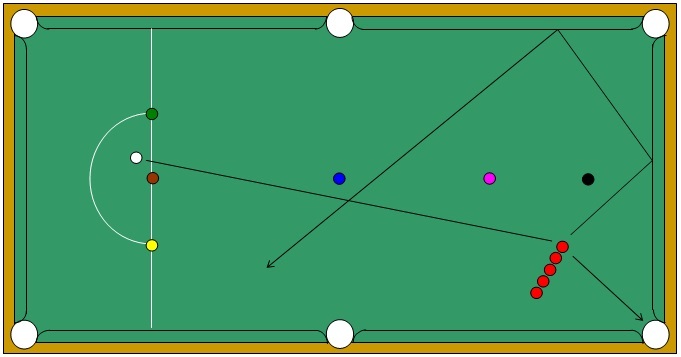 With the cue ball placed behind the baulk line each time, try to pot each red bringing the cue ball round the back of the black, inside the blue and into baulk. Note number of reds potted with position played correctly, then repeat challenge this time putting reds on other side of the table. Award a point for each red potted correctly and record score achieved.